How to set chapter availability dates for my course? How do I set chapter availability dates for my course? With ProProfs, you can make your course chapters available to learners on a predefined schedule to ensure that all learners move forward in the course at the same pace. By offering your course to learners a chapter at a time; you provide them the information in bite-sizes pieces, which helps to improve their understanding of the course content. For instance, you can create a five week course, wherein each chapter will be available to learners at the start of a new week. When learners take your course a message will be displayed telling them exactly when to expect the next chapter. The image below shows how the message will be displayed to your learners. 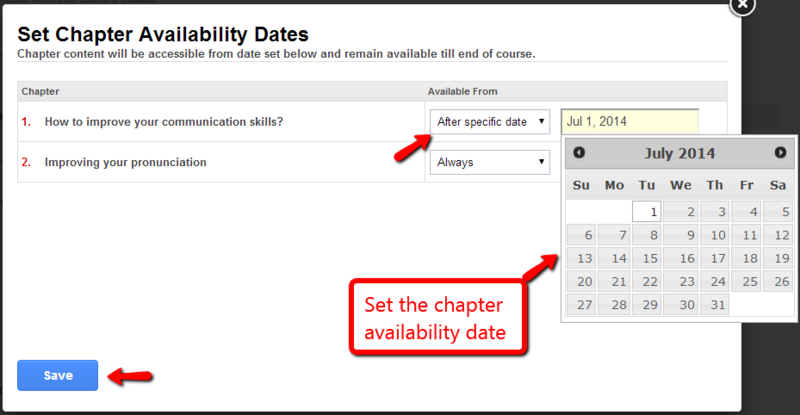 Follow the steps below to learn how you can set chapter availability dates. Step 1. Go to your Training Maker dashboard and click on "Edit Settings". Step 2. Under General Settings select "After a specific date" against Chapter Availability and then click on "Manage Availability". Step 3. Now, you can set the chapter availability dates. Click on "Save" once you're done.